Did you ever read Calvin and Hobbes? Did you love it? If you didn’t love it, close your browser window and read no further. I don’t think we’re compatible. For those left reading, I asked my initial question because I believe that artist Travis Hanson’s style evokes powerful memories of Bill Watterson’s comic. If someone were to recount Calvin’s exploits into Feyland from the perspective of Calvin himself, Monsters of Feyland by Cawood Publishing is the likely outcome. Update, 2019-02-06. Monsters of Feyland is now available in PDF and Softcover via DriveThruRPG (click here to check it out). Note: the first person to comment on this article with constructive feedback on what would have made the review more compelling will receive a free PDF copy of this product! 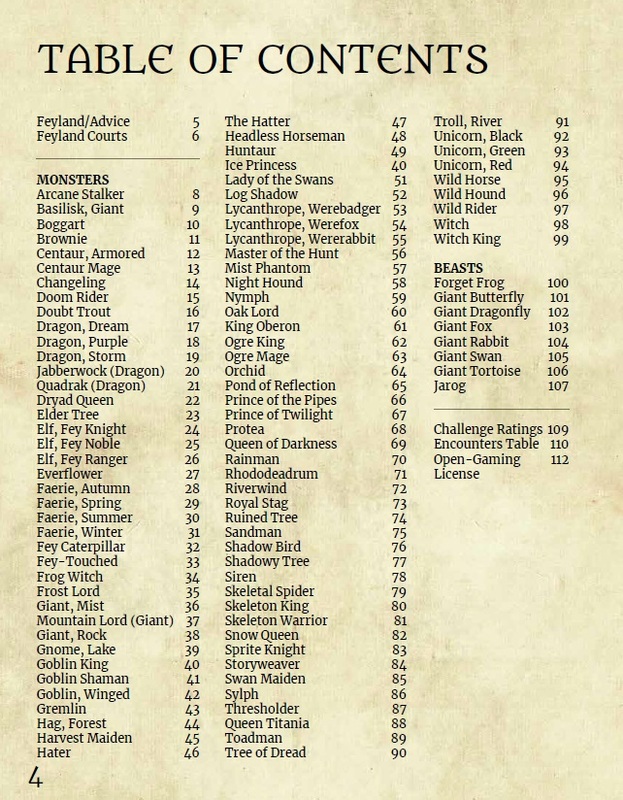 With Monsters of Feyland, Andrew Cawood of Cawood Publishing has teamed up with Travis Hanson to bring 100 new monsters to your 5th Edition campaign. As the title suggests, this is a compendium of fey creatures and the focus is on chaotic and/or evil creatures. In fact, I don’t think I saw a single lawful entry in this entire product. There are 17 good characters (neutral or chaotic). The rest are all neutral or chaotic and a fair amount of those are evil. These choices were deliberate and reflect the nature of fey creatures and Feyland. Unpredictable and potentially dangerous. A lot of the creatures contained within this product are a re-imagining of some notable characters from classic titles such as The Labyrinth and Alice’s Adventures in Wonderland there are also a lot of unique creatures as well. One of my favorites is the doubt trout. It’s not a creature you’d find yourself battling in a creek or anything. I envision one my NPCs, a retired bard with a strong histrionic personality disorder—and an illegal racket—using these things in an aquarium to throw off all suspicion should anyone come to him regarding his knowledge of drug trafficking in his city. However, even the re-imagined creatures like the Goblin King and the Jabberwock have been nicely converted to 5E in a manner that makes them feel right at home in Feyland rather than shoe-horned in simply for the sake of nostalgia. The writing is predominantly in the style of the Monster Manual. Each page is devoted to a single entry and has a stat block, a bit of detail, and Travis Hanson’s interpretation of the creature in question. The writing is mostly free of typos and none of these typos are so egregious that the meaning is questionable to the reader. They are simply the types of mistakes that we are all subject to when we don’t have a team of editors pouring over our work dozens of times. The design and layout was the responsibility of Jeff Porter and he’s done work for Cawood Publishing before. I can’t speak for those other titles, but I love what he’s done with Monsters of Feyland. Like I said before, you get one creature (or beast) per page. The charts for the Seelie and the Unseelie Courts is convenient for a quick reference to the good and the not-so-good of Feyland. A clickable Table of Contents for the PDF would have been convenient but it’s not a terrible oversight by any means. It just would have been icing on the cake, so to speak. I also love the unique stat block style that is different enough to give this book character without being a complete departure from the 5E style we’ve come to know. I have gushed already about the art, but it is worthy of high praise. Not every page has a detailed background like this but when it comes to the creatures themselves, no detail was overlooked. Travis was able to convey emotion even in a tree. The Elder Tree has the distinctive look of a crotchety old man that doesn’t want to be bothered the petty dealings of travelers. The design is mostly balanced. There are no lawful creatures to be found but that makes sense in Feyland. Aside from that neutral good through chaotic evil is well-represented. The challenge ratings for these creatures from as low as ⅛ all up to 25. There are beasts, dragons, fey, giants, goblinoids, humanoids, monstrosities, plants, and undead. Even if you don’t appreciate the light-heartedness of these creatures you will still find inspiration aplenty. There are no shortage of good monsters to include in your campaign whether Feyland takes a large role or small. As soon as I saw this on Kickstarter last March, I knew I had to have it. I’m a sucker for the nonsense of Lewis Carroll and the imagination of Jim Henson. Couple that with Dungeons & Dragons and Travis Hanson’s art and what you get is a winning product like Monsters of Feyland. If you missed the Kickstarter but still want this, don’t despair. It will available on DriveThruRPG very soon. I will update this article with a link to it as soon as it goes live. Note: while I backed this during the Kickstarter campaign for a PDF and print copy of the book, this review is based off a preview copy provided by the publisher. This was a great review! I love the artwork and the Calvin and Hobbes comparison drew me in! As for constructive feedback. I was guided here from your instagram account and couldn’t click or copy the link you had posted. Had to google and dig around to find your site. Making it easier accessed from instagram would be greatly appreciated! Thanks! Linking from Instagram is the bane of my existence. How I wish you could add a clickable link there. I try to update the link in my bio there but neglected to do so. I’m happy you were able to find it with Google though. Great feedback! Is the email address you used for your comment the best one for the PDF delivery? Love the Calvin & Hobbes opening, an unusual angle. Too late for the prize, constructive criticism anyway: you told us what the doubt trout was not. You were not clear about why you like it, or what it is. That is a great point, Will. The doubt trout is a tiny unaligned fey that casts an aura of doubt in a 30 foot radius, giving disadvantage on wisdom saving throws. Succeed on a DC 13 Wisdom saving throw or you will start doubting your decisions. That’s the 5 second overview. Why do I like the doubt trout? I envision some unscrupulous politician keeping them as pets in an aquarium or aquascape near where he receives guests. They’re not hard to kill so they’re not good foes but I thought they’d be interesting with the right NPC. In regards to what would make this review better, if you would be allowed to post an index of what it contained, that would go a LONG way towards helping people decide whether or not it would contain things interesting to them, but it wouldn’t give away any of the mechanics. Thanks, Justin! That is indeed a wonderful suggestion. I will address this as soon as I can.